This post is all about designing a beautiful website. First impressions can be essential. Unfortunately, the world we live in can be extremely judgemental. We automatically judge people by the way they look, dress, and function. The same exact thing happens with your blog. Did you know a survey put out by Microsoft found that attention spans only last 8 seconds? That means you only have 8 seconds to prove to your reader that they should continue reading your website. When starting a blog, you want to make sure to design a website that will hold peoples attention and get them reading your posts. This post goes over the questions I am asked most about where I find themes, how to set them up, what theme I am using and more. FAQ: How do I make my website look professionally designed? The secret to making your website look professionally designed is through themes. A theme is a template designed by a professional website developer who then goes on to sell them. 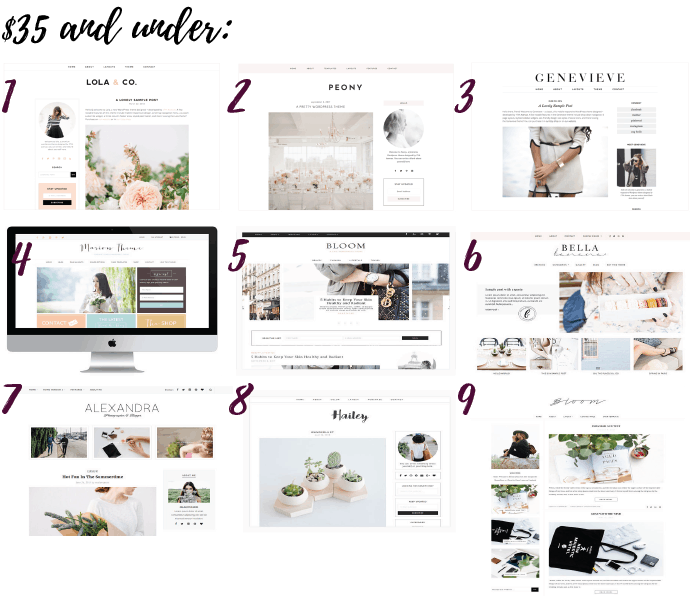 This is my #1 tip for new bloggers: Spend the little bit of money that it costs and get a theme. Themes start at just $10 dollars, so it won’t break the bank but it will make a huge impact. I do not recommend trying to design your website yourself. Unless you are a professional website designer of course ;). The reason for this is because if you touch one part of the coding you shouldn’t, it is extremely hard to get back to where you were before. Setting up a website is extremely difficult and time-consuming. 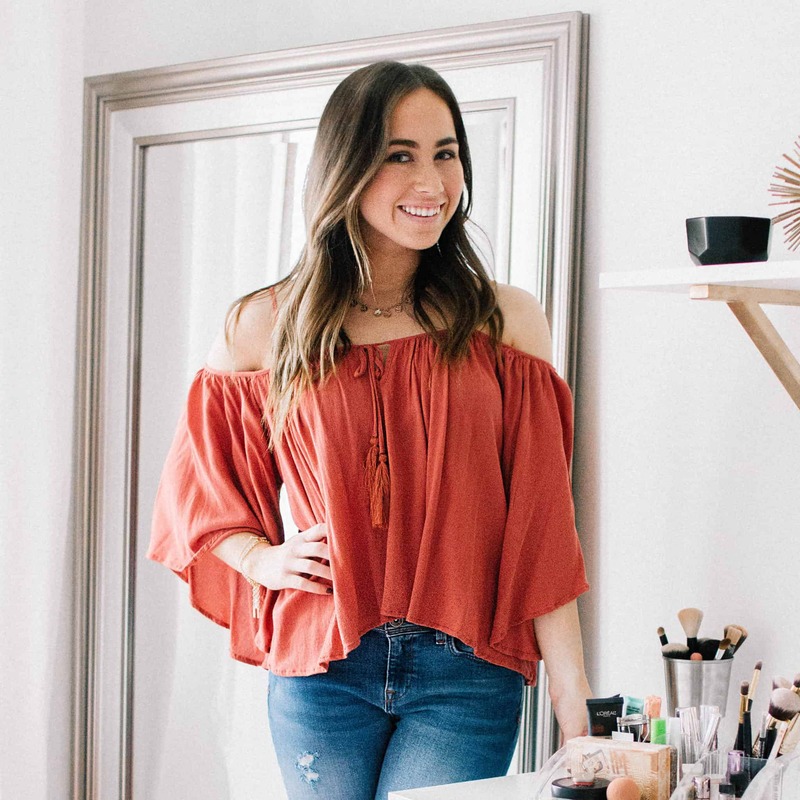 The way your website looks is important but if you want to make money on your blog, you have to start putting content out there! AKA, designing your own website is not as important as getting posts published and getting readers to your blog. SO, find a theme that you like (this post will give you a ton of options!) 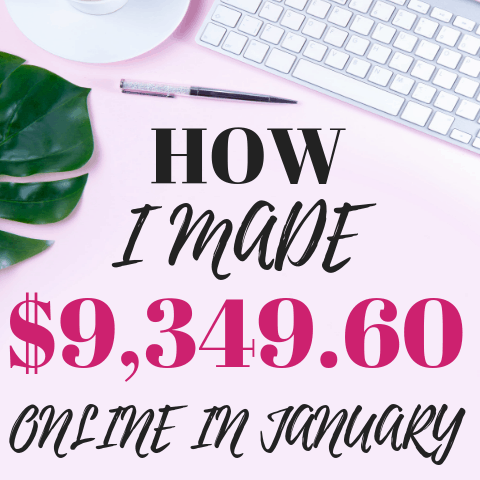 and you will be able to set up your whole website in less than an hour. My favorite place to find themes is 17th Avenue Designs. All of the themes are designed from a feminine and functional viewpoint. My favorite themes are from here and the customer service is amazing. If I have a question about something, I get an email back very quickly on exactly how to solve the question I have. 17th Avenue themes range from $35 to $59 dollars. For the quality and appearance these themes have, this is a great price. It is a one time cost so once you have a theme purchased, you never have to purchase one again. Another huge pro with these themes is that its mobile responsive so people on phones will have just as good of an experience as viewers on a desktop. Click this link to head to 17th Avenue Designs and you can see exactly how the theme works on your desktop or phone. Another place that has really good themes is Etsy. 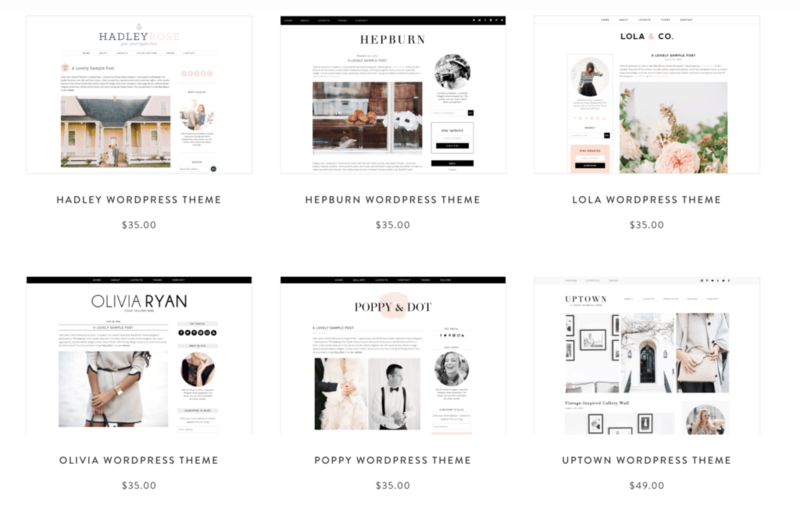 If you search “wordpress themes” on Etsy, you will have a ton of options to choose from. You can find extremely affordable themes here! I can’t speak for the quality of all of them but make sure to check out the comments and if they look good, go for it. I have bought two themes from Etsy and they were both great experiences. FAQ: Who designed your website theme? My theme is designed by 17th Avenue Designs. I have had this theme since August and have had nothing but good things to say about it! 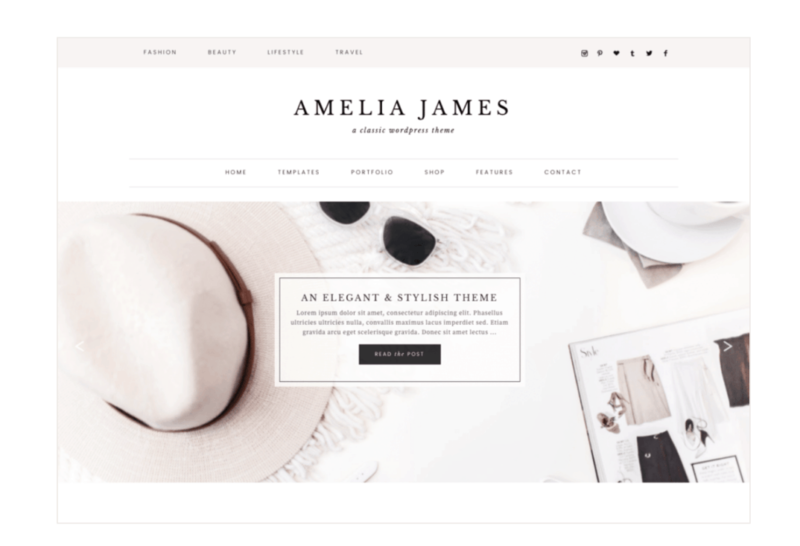 I have the “Amelia” theme, which you can find here. Two of my favorite things about it is how feminine and easy to navigate it is. I also love how there is a post slider that shows all my recent posts at the top. When I bought this theme, I had never used WordPress before so I had someone from 17th Avenue Designs set it up for me at a really reasonable price. That way, I didn’t have to do anything with the theme and it was ready for me to use in days. There are so many themes to choose from but these are the best themes available for 2018. They are clean, feminine, and easy to navigate. I know everyone’s budget is different, so I set up different categories of pricing so that you can find your perfect option. When purchasing a theme, you want to make sure that certain things are included. Is the theme compatible with other browsers and devices? You want to make sure that it is compatible since people will be coming through many different web browsers. A theme needs to be able to adapt to different sized screens, mobile devices, and website browsers. What can you customize? The description of the theme should list what you are able to change. Can you change the font? The color? Your heading? These are all things that you will want to look into. Does the theme adapt to WordPress updates? This is very important because you want to make sure that the theme will remain the way it looks even through WordPress’s updates (which happen pretty often!). 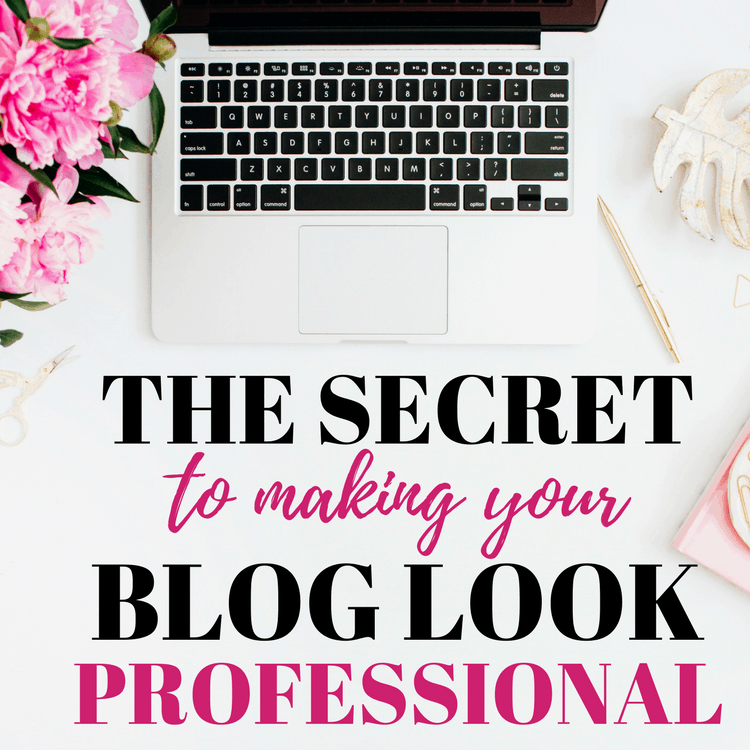 The way your blog looks is the first thing your reader is going to see. You need to make sure it looks good! 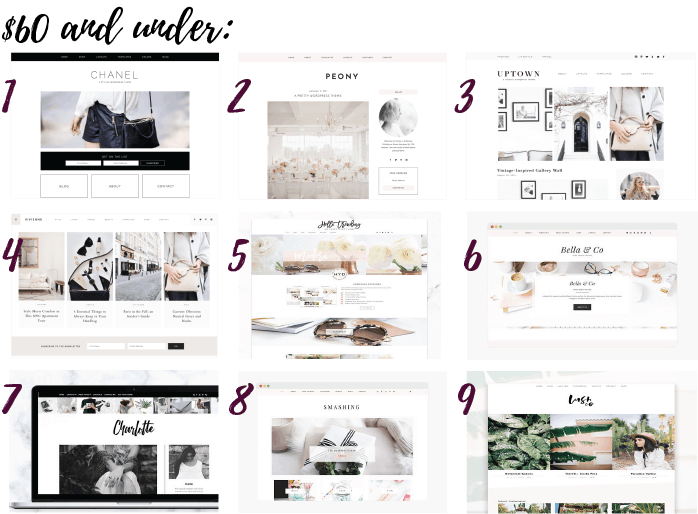 Choosing a predesigned theme is the easiest way to having your blog look professional and beautiful in a short amount of time.